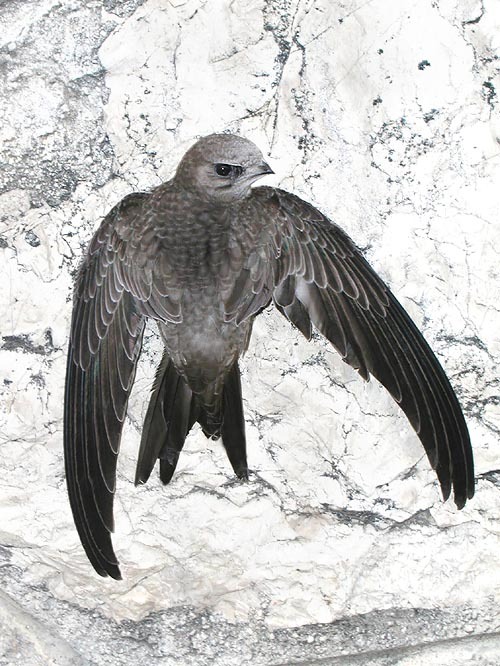 The Pallid swift (Apus pallidus Shelley, 1870), was discovered and classified by the British ornithological biologist George Ernest Shelley, who was also Captain of Her Majesty’s vessels. He described this animal in of his works about the birds of Africa, “The Birds of Africa”, continent where these birds, of passage in Europe go to winter. This animal is afferent obviously to the class of the Birds (Aves), clade or subclass of the Ornithurians (Ornithurae), superorder Neognathes (Neognathae), order Apodiforms (Apodiformes), family Apodids (Apodidae), and genus Apus. An exemplary case of evolutionary ecological convergence, is by sure that represented by swallows and swifts, birds very similar for shapes and silhouettes, so much that it is not easy to distinguish them when flying by the naked eye, but which, in reality, they are not even related by strict close relationships, on the contrary, they belong to two distinct orders: the pallid swifts, rightly, to the Apodiforms (Apodiformes), whilst the swallows belong to the Passeriforms (Passeriformes). Really tireless animals, continuously flying, the pallid swifts are close, phylogenetically speaking, to the humming birds, birds of the family of the Trochilids (Trochilidae), and to the less known members of the family of the Hemiprocnids (Hemiprocnidae), of which the grey-rumped tree swifts or the crested treeswifts are members. For instance the Hemiprocne longipennis and the Hemiprocne coronata: two species of autochthonous birds of southern Asia, commonly called, in Italian, “clechi”, which, with a total of 4 species, are diffused in the forests of the Sunda Islands and New Guinea. They have a tuft of erectile feathers on the head which forms a crest. They are wonderful birds for their livery, but less active and life chiefly arboreal than the swifts of the genus Apus, and which, unlikely these ones, nidify on the trees. The phylogenetic proximity is greater between the family of the Apodidae and that of the Trochilidae, rispetto a quella degli Hemiprocnidae, but it is in any case sufficient for getting the three of them converging into the order of the Apodiformes. 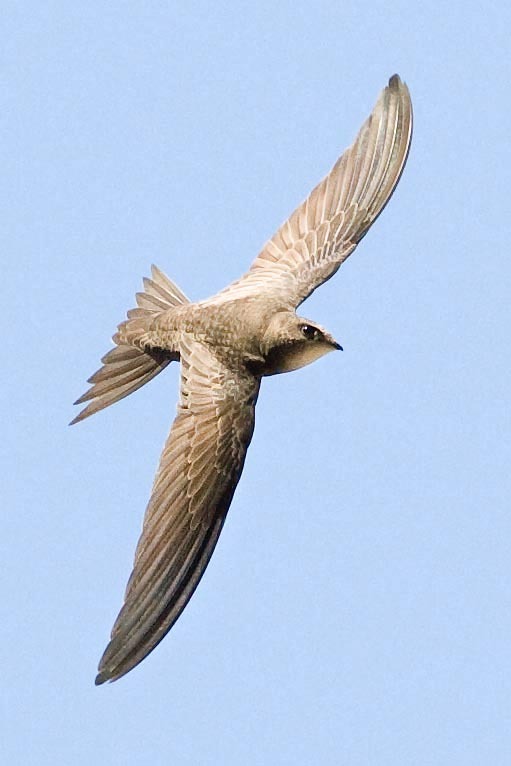 The pallid swift, like the other species of swifts observed in Europe and therefore in Italy, that is the Common swift (Apus apus) and the Alpine swift (Apus melba), is a tirelessly flying bird, even if it’s the greatest demonstration of the “perpetual motion”, or of the indefatigability is represented by sure by the Apus apus, in constant flight from the moment it learns how to fly. It nourishes in flight, it flies for finding the material (straws, branches, mould, mud, leaves, etc.) needed for building the nest, it mates in flight and, after some ornithological biologists, it even sleeps in flight, probably decreasing the neurophysiologic activity when sleeping, of one hemisphere at the time, keeping the other active, in order to coordinate the flight, avoid the obstacles and escape for possible predators, such as the diurnal raptors (hawks, kites, etc.) and nocturnal (little owls, falcons etc.). The female as well as the male, halt only during the hatching of eggs, two which both of them take part. 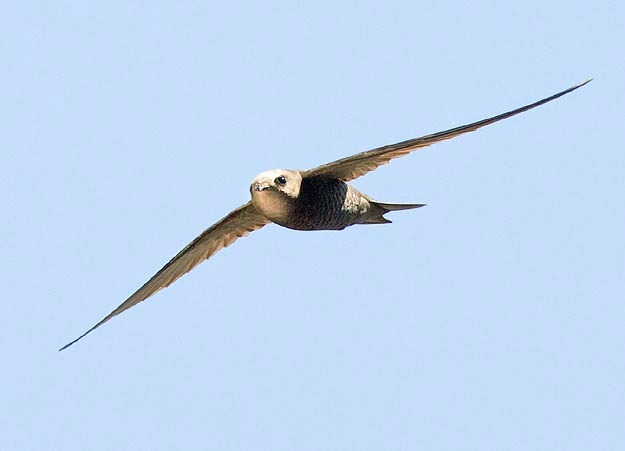 The pallid swift is observed in Europe, and therefore also in Italy, only during certain moments of the year. In Italy, it is noted between May and June, and then from here it leaves towards Asia, in late summer. Like theApus apus, it nidifies in summer in western Asia, whilst Africa is their area of hibernation. It seems, however, that the Apus pallidus (less rare than what was thought till twenty years ago, and often mistaken by the neophytes with the Apus apus), is localized in Europe especially in the central-southern part and in the ancient settlements of south-eastern Europe. It is difficult to talk about specific habitats for a bird spending most of its life in air, flying. What we can say is that it loves cliffs, rocks, ledges of the walls, and attics, to which it clings firmly, whilst it is totally unable to walk on the ground. On the other hand, the name of the order to which they belong, the Apodiformes, is a compound word coming from the ancient Greek meaning footless, due to their extremely poor usage of them. The ornithological biologists define their little functional foot as “pamprodactylous”. The Apus pallidus differs from the Apus apus and from the Apus melba due to a fundamentally lighter colouration and to the more extended white of the throat, even if, from subject to subject, this last character may much vary, and we may observe subjects with less white in the chinstrap. The sexual dimorphism does not exist, neither transitory-seasonal, nor permanent, between the two sexes. It has a grey brown-sooty colour on the primary and secondary coverts of the back and on the remiges of the wings, to which extremity it becomes darker, even black. Same applies to the rectrices of the tail. The tail is fairly long and forked, even if much less than in the Apus apus, with which often it shares the nesting areas. The head is grey, paler on the face with a small pointed beak with which, flying, it seizes the insects. The eyes are much alive and have a black pupil. The legs are short and robust. In the rare instances when it has rested on a wall or a rock, the wings, are aside and assume the conformation of a crescent. It has a wingspan of about 40 cm and a length of 16-18 cm. It is one of the fastest birds of the planet, as, when swooping down it the 300-320 km/h, competing with the fiercest hawks and eagles. Some astronomers, during the observations of the stars, have incurred in these birds which may fly ate high altitudes. Absent of dimorphism between the sexes, they reproduce in summer in western Asia. The Pallid swift (Apus pallidus) nidifies in the rocky cliffs, attics and recesses of the old buildings. It is a monogamous species. The male as well as the female participate in the brooding of the 3-6 eggs laid, even if, during the first ten days, this role is mainly reserved to the female. The hatching lasts about forty days, and both parents nourish the newborn.